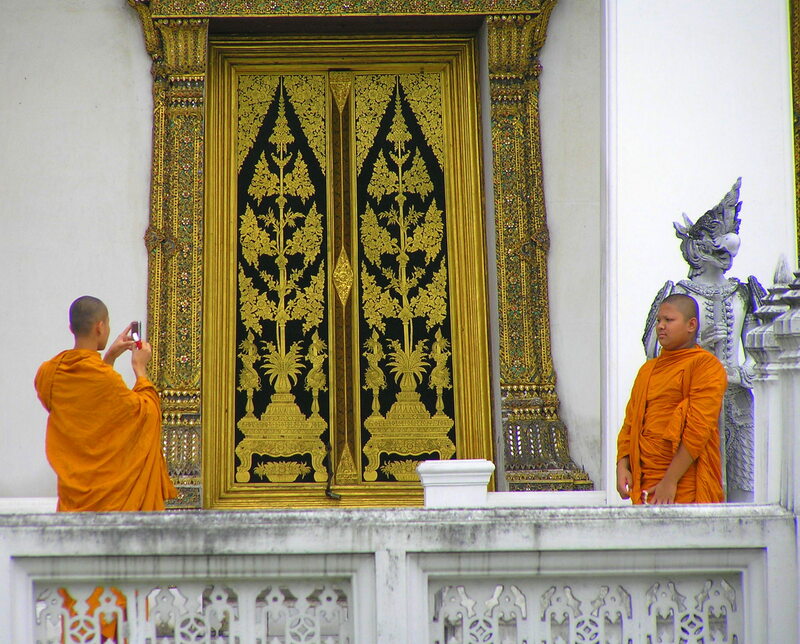 I spent an amazing three weeks in South-East Asia in the autumn of 2008. Hong Kong and Singapore were fabulous (more on those another time), but it was Thailand that I really fell in love with. 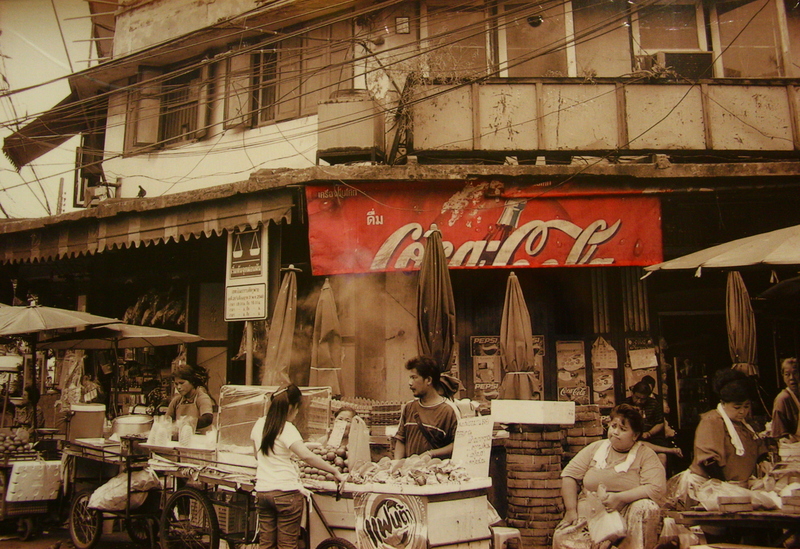 It’s hard not to when the food, people, sights and culture are so vibrant and exotic. We first flew to the island of Phuket. Our hotel – The Cape Panwa – was in an idyllic, secluded bay of white sand and crystal-clear turquoise water. Heavenly! There was a colonial-style restaurant right on the beach and the hotel had its own jetty into the sea. The food was incredible – giant langoustines, thai curries and delicious cardamom rice pudding – and the beach was the nicest I’ve ever been to. Swimming, sunbathing, reading, and seeking out crabs were the order of the day. 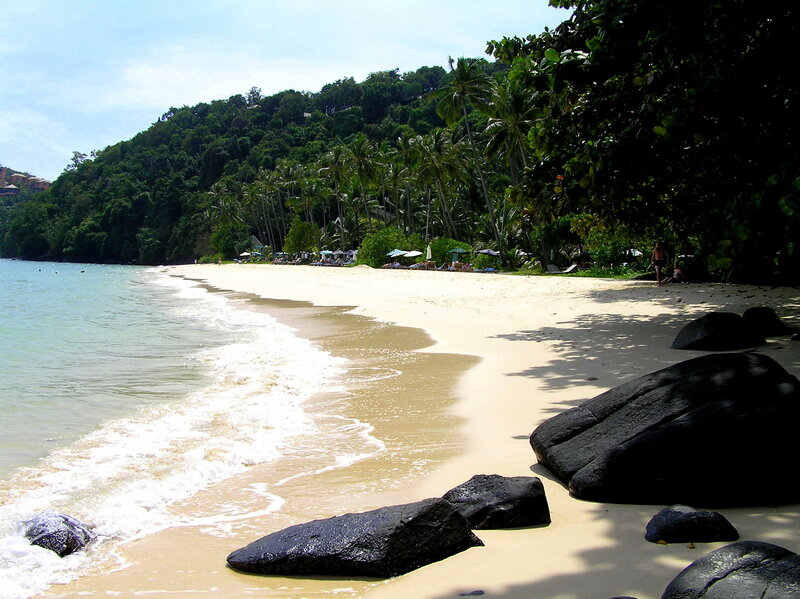 As tempting as it would have been to lie in a hammock for a week, Phuket has many other attractions. 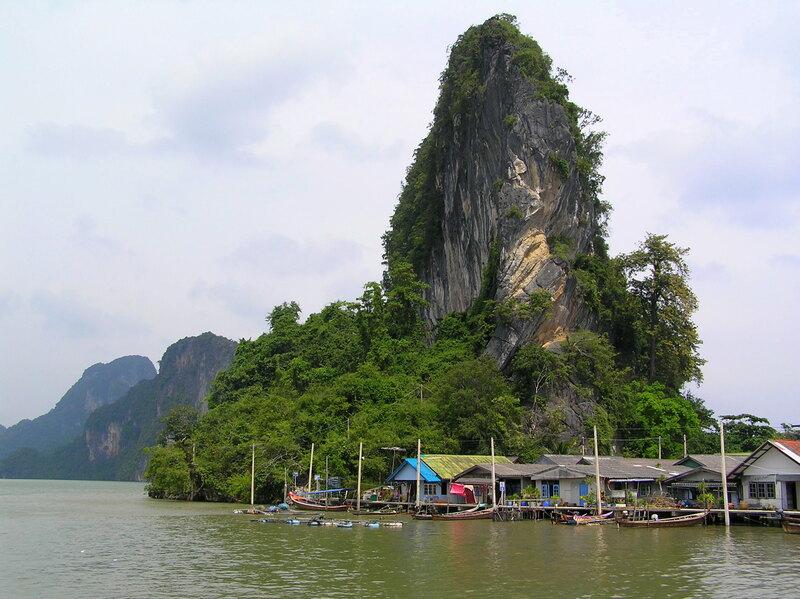 You can’t visit without taking a long tail boat trip into the Andaman Sea to Phang Nga National Park, with its many beautiful islands. We stopped at James Bond Island (so named for featuring in The Man With the Golden Gun) for a look around, spying iguanas on the beach and wading through rock pools. You wouldn’t know that the area had been devastated by the Tsunami in 2004. It’s simply stunning. We also stopped at Ko Panyi, a Muslim fishing village built on stilts by Indonesian fisherman from Java. We visited the small primary school and floating football pitch, and strolled along the raised streets, where hundreds of chillies were hanging from washing lines drying in the sun. We also headed into the hills for an elephant trek. This was a real highlight for me. We were able to feed the baby ‘phants with bananas, stroking their trunks as they pulled the fruit from our hands, before climbing onto the backs of their parents for a journey through the jungle rainforests and up to a mountain village. 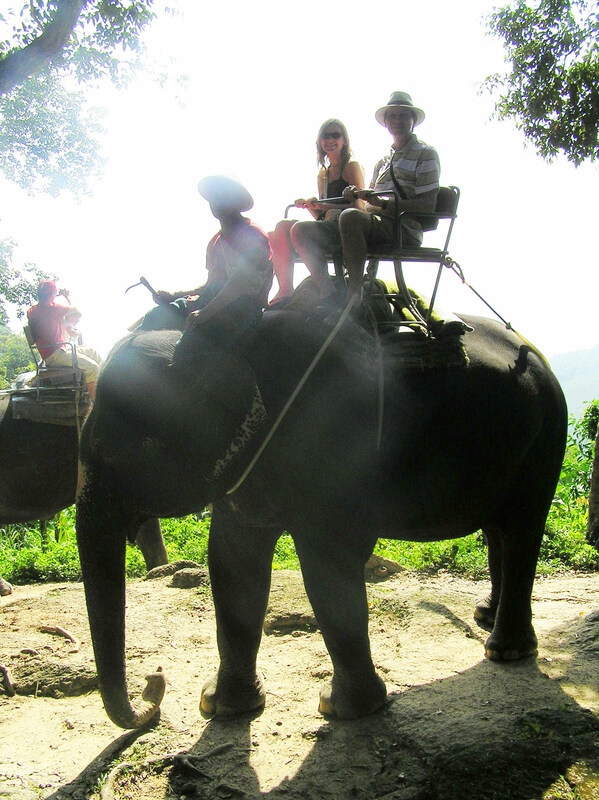 The views over the island were lovely and our elephant was beautiful, giving us a smooth ride. We meandered at a leisurely pace, occasionally stopping for some shade. In the village, we had a cookery lesson – making a spicy red curry – and a ride on a cart pulled by a water buffalo. We were also shown how the villagers make baskets from coconut husks and how to tap rubber trees. Great fun! Bidding a fond farewell to paradise, we flew on to the capital: Krungthepmahanakhon Amonrattanakosin Mahintharayutthaya Mahadilokphop Noppharatratchathaniburirom Udomratchaniwetmahasathan Amonphimanawatansathit Sakkathattiyawitsanukamprasit (or Bangkok to you). The city’s ceremonial name translates as “City of angels, great city of immortals, magnificent city of the nine gems, seat of the king, city of royal palaces, home of gods incarnate, erected by Visvakarman at Indra’s behest”. Nice, huh? After checking in at our hotel on Rajdamri Road, we caught a taxi to the riverfront and jumped on a boat down the Chao Phraya. The taxi driver had ripped us off, it transpired, but given I’m used to London prices I didn’t notice. It was only after comparing the price of the return journey that I realised we’d paid about six times too much. Still, you live and learn. The boat trip was lovely, taking us past Wat Arun and many other famous sights, then down tributaries into more residential areas, with the houses perched precariously on stilts driven into the alluvial plains. An Asian buffet atop Baiyoke Tower II, the tallest building in the city, and a stroll through the Ratchathewi and Pathumwan districts concluded the day. 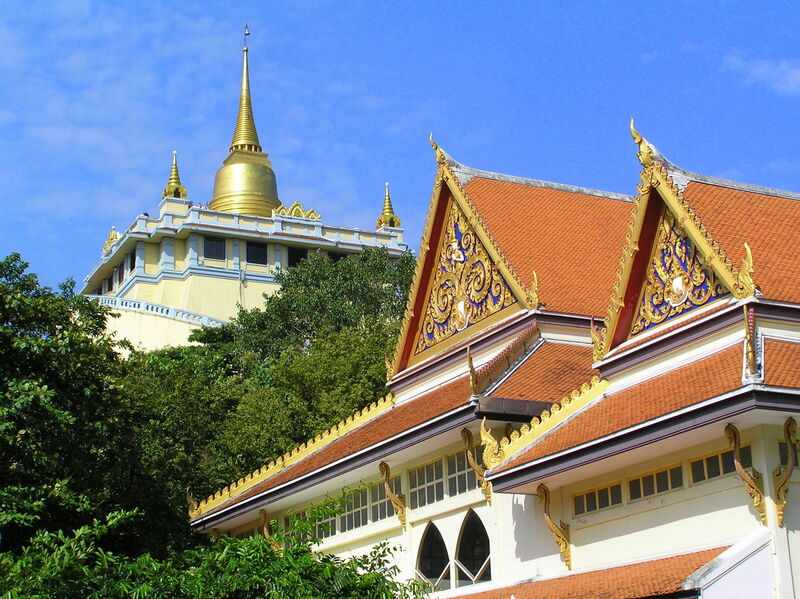 The next morning we tried to get to Dusit Palace, but – fearful of political unrest and protests against the Prime Minister which were taking place in the area – our taxi driver instead suggested a visit to Wat Saket and The Golden Mount. 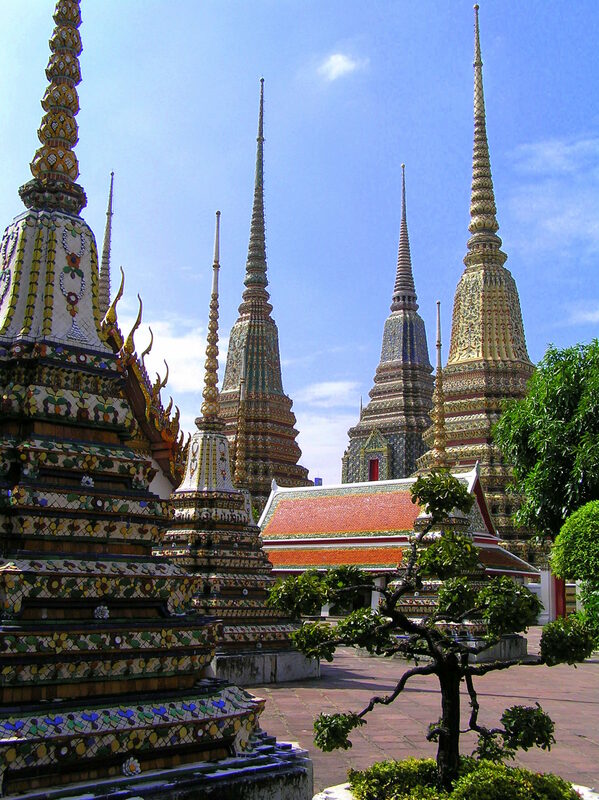 It’s worth the climb to the top of the Mount for the views over Bangkok, and without the usual throng of tourists the temple is one of the most peaceful in the city. Having waited patiently for us while we wandered around, and only charging us about £3 for doing so (further reinforcing my conviction that yesterday’s driver was a ne’er do well), we went on to the Phra Nakhon district. The Grand Palace was also disappointingly off-limits, the result of a royal birthday or funeral (I forget which), so it’s difficult to say how it would have compared, but Wat Pho was certainly one of the most impressive places I’ve been to. 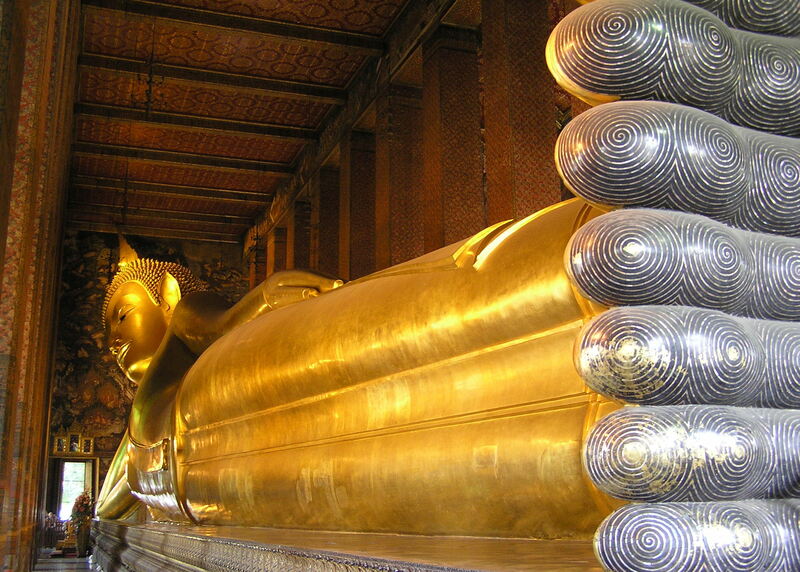 It’s named after the monastery in India where Buddha is thought to have lived and is home to the gigantic (160 foot) Reclining Buddha as well as over 1,000 other images of ya main man. The large temple complex takes a long time to get round, with its various shrines, gates, statues and courtyards, and we were ready for a sit down in a cafe by the end. Only a short pause though, before we headed into the district of Samphanthawong in Chinatown and to Wat Traimit, home of the largest solid gold statue in the world (Buddha, of course). Here I received a blessing from a Buddhist monk (for a small fee) and we were able to sit in the shade for a while, our legs having started to ache. Time to head back to Thanon Ratchadamri, with its western shopping malls and restaurants, for a bite to eat. An outdoor beer festival was in full swing, so we tried some Thai brew and got a bowl of the spiciest soup I’ve ever tasted thrown in as a free accompaniment. No longer able to feel my tongue or lips, it was time to call it a night. The next morning, we rose at the crack of dawn and drove out of the city, boarding a long tail boat to Damnoen Saduak. 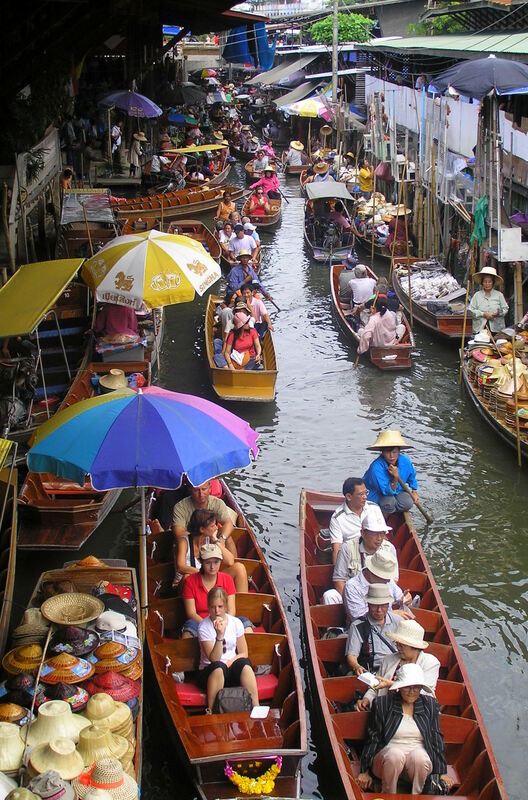 Sailing past salt fields and rice paddies, you arrive at the network of canals that form the traditional floating market. 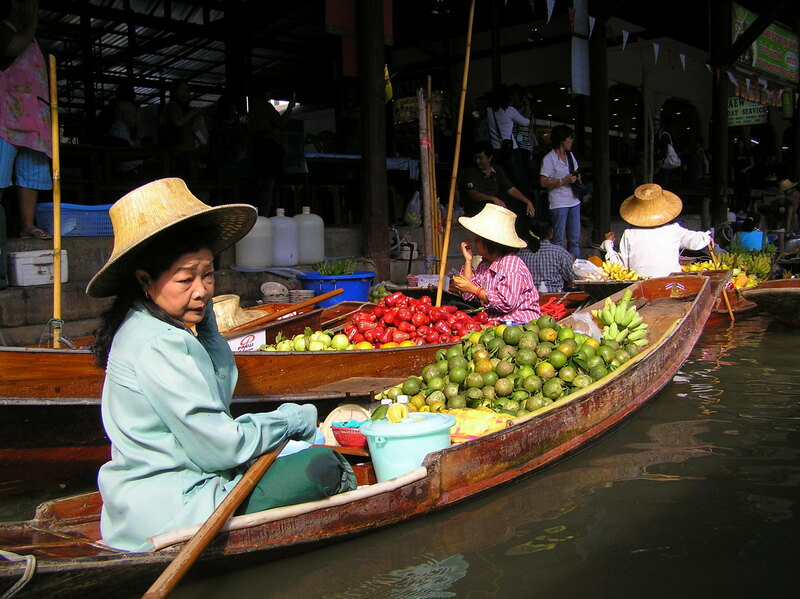 It’s really bustling, with women in straw hats paddling in boats laden with mangoes, coconuts, Chinese grapefruit and other exotic fruits and vegetables. Some were also cooking up large cauldrons of broth and curry. The smells and sounds were fantastic. I didn’t dare barter for anything – it was all too frantic and several of the traders had large snakes around their necks – but it was enough to soak it all in. Next we travelled to Phra Pathom Chedi in the town of Nakhon Pathom and climbed the many steps – in the now searing midday head – to the largest pagoda in Thailand. The pagoda is a huge upside-down bell-shaped structure, surrounded by some of the more uniquely-posed Buddha statues. After that it was on to the Rose Garden cultural centre, where were saw a performance of fingernail dancing, Thai boxing, an elephant parade and a recreation of a traditional Thai wedding ceremony. A great end to our Thailand adventure! Luckily we flew onward to Hong Kong before the take-over of Bangkok’s Suvarnabhumi Airport by the activists of the People’s Alliance for Democracy, which saw around 3,000 tourists and locals trapped in the terminal for about a week. While I would happily have spent longer in the country, it was most definitely a lucky escape! This entry was posted in Travel and tagged Bangkok, Elephant, Monk, Phuket, Temple, Thailand, Wat on April 6, 2013 by victoriassecretblog.